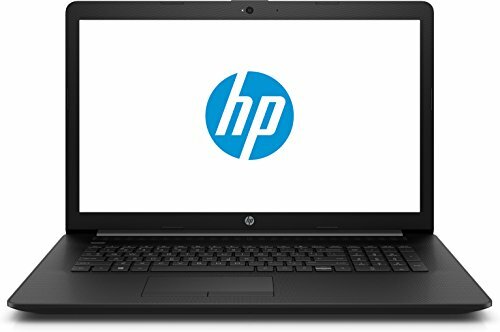 HP 17.3" Laptop Intel Core i5-7200U 8GB memory 1TB hard drive - JET black. HP Laptop: play games all day with this 17-inch HP Laptop. The Intel Core i5 processor and 8GB of DDR4 RAM allow for smooth playback and quick loading, and the 1TB Hard drive stores a large collection of projects. This HP Laptop has an HD+ display with 1.4 million pixels for sharp photos and graphics. 2 x USB 3.1 Gen 1 (data transfer only), 1 x USB 2.0, 1 x HDMI, 1 x RJ-45, 1 x Headphone-out/Microphone-in Combo Jack. Windows 10 Home, 15.34" X 10.94" X 0.97", 5.29 lbs.. 8th generation Intel Quad Core i5-8250U Processor, 1TB SATA hard Drive, 8GB DDR4 SD RAM. Integrated 10/100/1000 GbE LAN, 1x1 802.11AC WLAN, Bluetooth, DVD-RW, HD Webcam. 17.3" Diagonal HD plus SVA bright View WLED-backlit 1600 x 900 display, Intel HD Graphics 620 with up to 4160 MB.